WHAT I SMELL: Bois d’Iris is oh so inviting when it first goes on the skin. It’s like soft iris infused cashmere that’s lightly sweetened and tinged with sun. The perfume feels like a late spring morning where the dew of the evening before has just evaporated off the flowers and greenery of a beautiful garden. The iris is very contained, but nicely warmed with the lightest amber that helps to give the perfume a golden hue of radiance. After some time, the iris retreats to make way for a buzzing labdanum. Still golden, the perfume moves from floral to almost entirely wood. Eventually, the perfume moves to the powdery and it becomes slightly sweeter , but the sweetness is kept contained by a dried woody vetiver. Overall, a very easy wear. To smell wood, to see its scent from a totally different angle, forget the idea of the forest, leaves and earth , and picture it on a beach, floating in waves, and washing up on the sand. Driftwood warmed by the sun. I paired it with Ambergris and Labdanaum to underscore the solar and sensual dimension of this wood. Iris and Vetiver bring out the texture and elegance of this fragrance. WHAT IT SMELLS LIKE TO ME: Beach bonnet. It’s a lightly sweet floral wood tinged with the sun, with a salty woodiness that is pretty, yet elegant and refined. BOTTOM LINE: Bois d’Iris is sweet, pretty, rather demure, and fun in a 1950’s kind of way. A perfect perfume for wearing at the office, or a fun day out on the town. 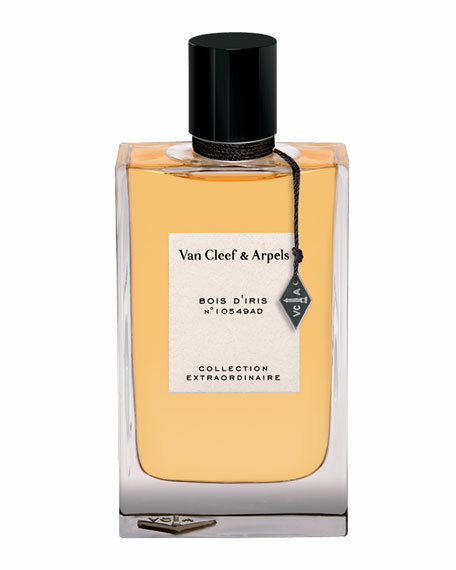 Categories: Van Cleef & Arpels | Tags: 3 bones, Bois d'Iris, EDP, floral woody musk, fragrance, parfum, Perfume, Perfume Review, review, unisex, Van Cleef & Arpels | Permalink. WHAT I SMELL: Rahele quietly opens soft but very luxurious, with a dewy green and velvety violet, tinged with the lightest of citrus and spice. There’s an incredible warmth that immediately draws you in. Soon after opening, a cinnamon note moves forward making a nice balance between the florals and the lightly exotic spice. After a few more minutes, a demure, but noticeable osmanthus comes forward. At this point the perfume feels like a still life painting filled with the most delicate of flowers and fruit. As the perfume continues to develop it begins to powder and dry. Even with a projecting powder, Rahele remains incredibly subdued and meticulously blended, where no particular note stands out, but is perfection in the sum of its parts. In the end, the lightest of leather topped by a layer of oakmoss makes this a sublime ode to French perfumery. WHAT IT SMELLS LIKE TO ME: What I envision a 17th Century powdered wig to smell like. BOTTOM LINE: Rahele strays from the exotic flourishes of the other Neela Vermeire Creation perfumes in the collection, although not completely. Rahele is all about classic french perfume and as I am a huge fan of the classics…I have to say that this might be my favorite in the collection. But that’s like stating which of your children is your favorite…it can’t be done. Expense: $235 for 60 ml eau de parfum. Categories: Neela Vermeire Creations | Tags: 4 bones, Bertrand Douchaufour, EDP, Feminine, floral woody musk, fragrance, Neela Vermeire Creations, New Release, parfum, Perfume, Perfume Review, review | Permalink.